With so little two-color Technicolor surviving, it’s almost depressing to even talk about it, but the examples we do have are so fascinating to look at --- so unusual in the way they reproduce color --- that I for one can’t get enough of them. 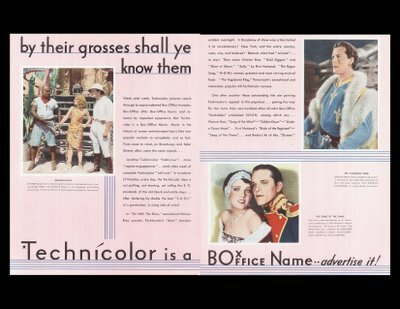 This trade ad from 1930 is misleading in that the images imply a fuller range of colors than the movies themselves could actually deliver, but this sort of puffery was only to be expected from a company still trying to establish an exhibitor (and public) demand for Technicolor. Golden Dawn, pictured here, is today only available in black-and-white, and most of the others mentioned in the ad are gone altogether. These creaky old shows, a lot of them musicals and operettas, would no doubt be hard to get through for any audience other than dedicated buffs, but I suspect that, with color, they’d spring to life readily enough. I still remember seeing Mystery Of The Wax Museum at a college showing in 1975, and what an absolute thrill it was to see this long-thought-lost horror film (in color too!) for the first time. 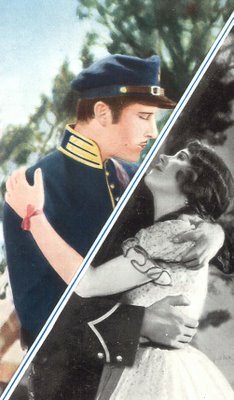 TCM has shown a handful of two-color samplings over the years. It’s always fun to turn on the end of a feature and have some oddball MGM short turn up --- The Devil’s Cabaret comes to mind. That’s the one where a satanic Charles Middleton presides over a distinctly pre-code, muti-hued Hell. They’ve also shown Dixiana, pictured here with Bebe Daniels, though Song Of The West, our split-screen photo illustrating color vs. black-and-white, appears to be a lost film. 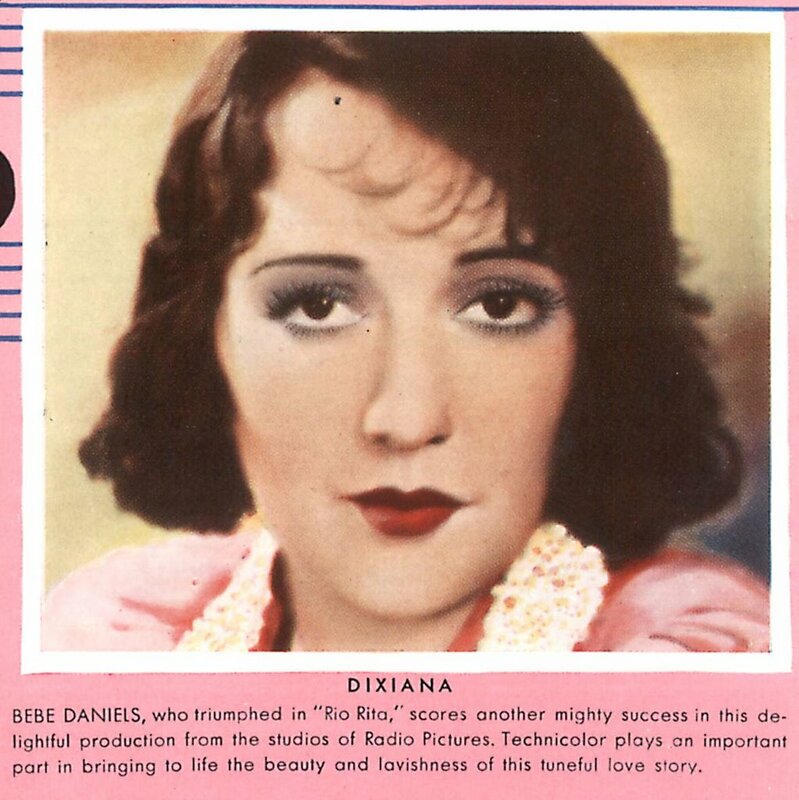 I vote Bebe Daniels for a Monday Glamour Starter. I, too, remember watching "Mystery of the Wax Museum" with a friend in the mid-70s -- then being disappointed at what a mediocre movie it really was. Now, "Dr. X" with Lionel Atwill, also in Technicolor -- that's another story altogether: "Synthetic flesh! Synthetic flesh!" 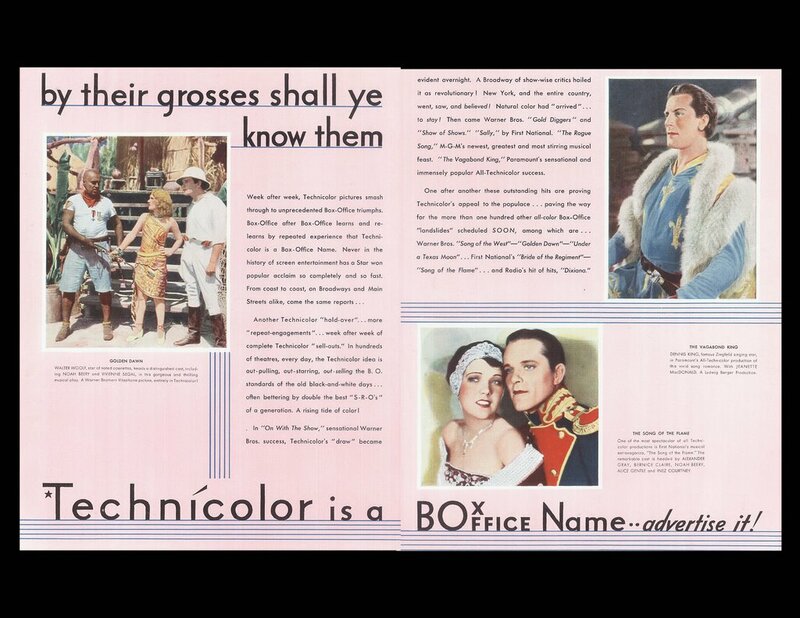 That two-color process definitely gave movies a dreamy look that can't be reproduced now. Mystery at the Wax Museum does have the wax cracking climax from Fay Wray. It's no House of Wax, but that is a lovely moment! I have a PAL VHS copy of "Mystery Of The Wax Museum" and another one of "The king of Jazz" and "Whoopee! "...They where transmitted on British Television. I also have copies of "The Black Pirate" and "Becky Sharp"....The BBC will show next Tuesday the recovered pioneer colour footage of Claude Friese-Greene. The material they've shown on the trailers is amazing. I remember King of Jazz being a bit of a long haul - but it has a great technicolor cartoon from Walter Lantz, and the Bing Crosby/Rhythm Boys stuff was good. Love Whoopie - in fact, how come there's no Eddie Cantor DVD Box set? Re: Poptique -- I wonder if there's a real interest in Eddie Cantor these days. Like Jolson, Cantor's lacks subtlety. As much as I like Jolson, I understand why his histrionics (as well as Cantor's) turns off today's audiences. One gag in "Whoopie" makes me a little queasy. In order to hide from the bad guys, Eddie -- a Jewish guy, mind you -- ducks into a gas oven. Sure, it was made in 1930, but still -- hoo boy, that bit gives me the willies! Sticking with Cantor - I agree with East Side that there probably isn't a great deal of interest, but the Cantor movies do have all those great Busby Berkeley numbers and the Goldwyn Girls!